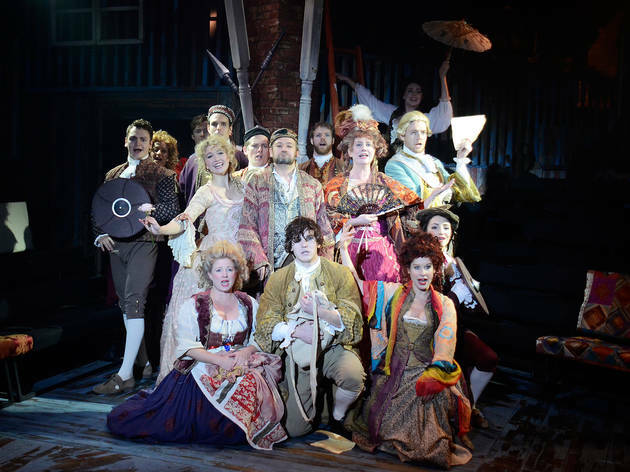 With everyone from Leonard Bernstein to Stephen Sondheim having pitched in to try and patch 'Candide' up since its 1956 premiere, it’s amazing that this bonkers musical exists at all. It’s an all-singing picaresque piss-take that’s bound to get right up some people’s noses. And it’s great fun. 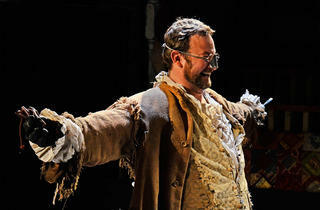 Director Matthew White’s in-the-round staging puts the volts into Voltaire. His superb cast grabs writer Hugh Wheeler’s adaptation of the French philosopher’s satirical novella on optimism and fling it wildly around the Menier. Bernstein’s rich score – his witty lyrics bolstered by Sondheim – rings out in surround sound from flag-draped balconies and alcoves. 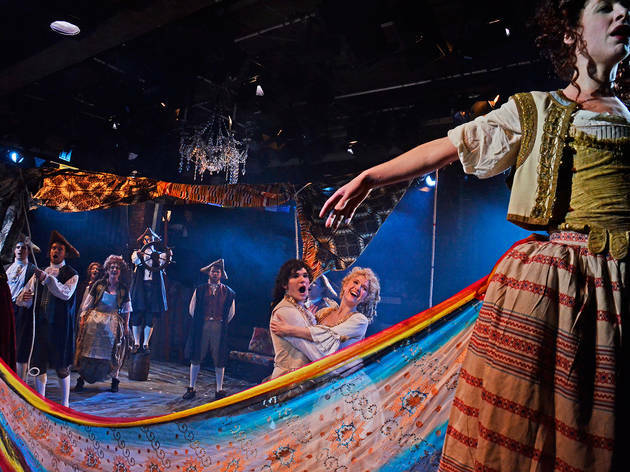 The flimsy story follows Fra Fee’s wide-eyed Candide as he journeys across Europe and into the New World, enduring wars and earthquakes in pursuit of his one true love, Cunegonde. The ballads are okay but it’s really about the carnivalesque atmosphere. Supposedly dead characters pop up with outrageous survival stories and nonsensical scenarios come and go, as the show gets more ridiculous and more hilarious. 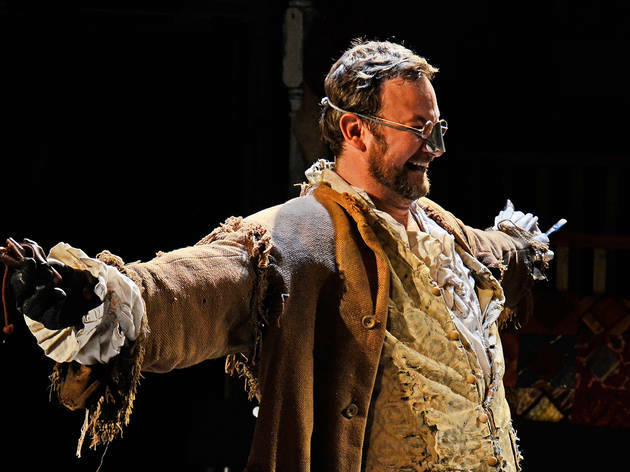 James Dreyfus shines in multiple roles, including Pangloss, Candide’s idiot philosophy teacher who steadfastly maintains this is the best of all possible worlds even as he’s being hanged. 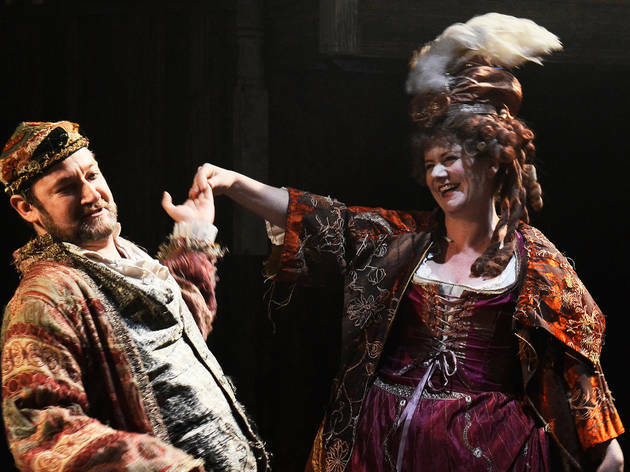 Jackie Clune’s hard-bitten, one-buttocked Old Lady is also a salty delight, while Scarlett Strallen is a rib-tickling revelation as bling-obsessed Cunegonde. Her operatic ‘Glitter and be Gay’ is a top-note showstopper. 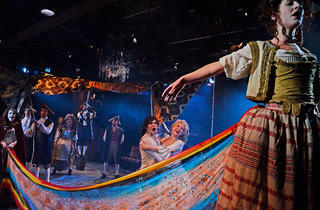 It might not explicitly be a Christmas show, but this production has the same impish, audience-winking humour as panto. 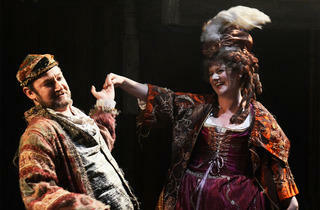 The show's script is messy and whether you love or loathe it will depend on your tolerance of its theatrical flippancy. But if you can leave your stern expression at the door and embrace the pink sheep, you’ll have a riot. I've been twice and wish I could go again. Stunning production that had us both laughing until we wept. 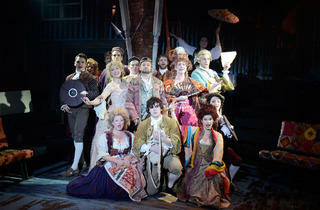 Such talent, such beautiful voices, gorgeous ensemble singing, comic timing, it has it all. And, I am still singing the songs. I enjoyed the production at ENO a few years back but this beats it by miles. What a privilege to have been able to see a cast of this quality in a production of such imagination and energy and all as if they were performing just for you and a few friends! quaint venue, small but very cosy. story, cast, music : great stuff !! Not the way I have ever conceived of the show before but it was charming, funny and beautiful. I am very glad I am going again next week. Agreeing with AndrewM, the songs have remained with me well after I left the auditorium. A brilliant evening - hilarious and fast-paced farce, but with really beautiful music and a slick production. A great alternative to the inevitable Christmas panto or big-budget West End musical - funny, entertaining and heartwarming - 10/10.